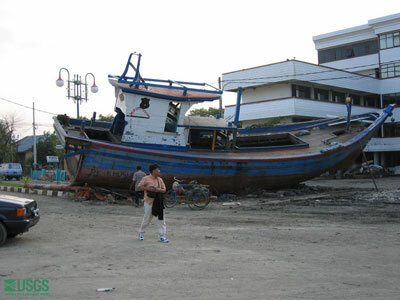 Boat was washed up and stranded ashore in Banda Aceh on January 20, 2005. An International Tsunami Survey Team (ITST) studying the effects of the December 26 tsunami on Indonesia's island of Sumatra documented wave heights of 20 to 30 m (65 to 100 ft) at the island's northwest end and found evidence suggesting that wave heights may have ranged from 15 to 30 m (50 to 100 ft) along at least a 100-km (60 mi) stretch of the northwest coast. These wave heights are higher than those predicted by computer models made soon after the earthquake that triggered the tsunami. "Groundtruthing" the models, which are used to forecast tsunamis for early-warning systems and long-term planning efforts, was one of the main goals of the scientific survey. The survey was conducted from January 20 to 29, 2005 in the province of Aceh, which lies only 100 km (60 mi) from the epicenter of the earthquake and sustained what many consider the worst tsunami damage of all affected areas. About a third of the 320,000 residents of Aceh’s capital, Banda Aceh, are dead or missing, accounting for much of Indonesia’s toll of more than 128,000 dead and nearly 40,000 missing*. 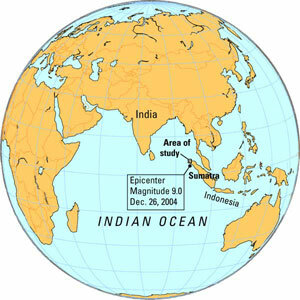 Location of Sumatra on a global map. *Numbers from news stories dated April 18, 2005.